The HTC Vive VR headset will be going wireless from September 24, with HTC officially announcing a wireless adapter which offers users the ability to play VR titles without being tethered to a PC. Setting up the wireless adapter is fairly quick and straightforward: it apparently takes only minutes to install the PCI-e card and place the wireless sensor which connects the PC to the wireless headset. Once installation is complete, users can move up to six meters away from the sensor device, with a 150-degree field of view. The Vive Wireless Adapter retails at $299 / £299 / AU$459 and includes a wireless adapter, link box, one HTC QC 3.0 battery pack (which can also be used with HTC smartphones), accessories for the Vive and PCI-e WiGig card. According to HTC, the Vive Wireless Adapter works with both Vive and Vive Pro. 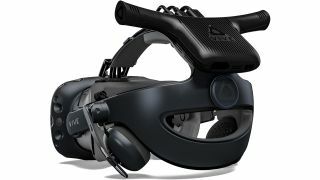 Vive Pro owners, however, will need to purchase an additional compatibility pack, which comes with a unique connection cable and attachment device, alongside a pad cushion. This pack costs $60 / £65 / AU$110. All Vive Wireless Adapter purchases will also include a two-month trial subscription to Viveport - HTC Vive’s official app store. You can pre-order the wireless adapter from September 5. For customers in the UK, pre-orders will be available at Overclockers, Scan and Vive.com. For customers in the U.S., pre-orders will be available at Amazon, Best Buy, Microsoft, NewEgg and Vive.com. We've reached out to HTC to ask where Australian pre-orders will be available. Other retailers are to be confirmed at a later date.